A “pop-up shop” is a short-term, temporary retail event that is "here today, gone tomorrow". Pop-up retail is the temporary use of physical space to create a long term, lasting impression with potential customers. The pop-up store has become a go-to marketing strategy for retailers looking to extend the brand and introduce new products. Retail Pop-Up Store are being developed in a variety of shapes and sizes, as well as locations. Create an instant Retail Pop-Up Store with the WaveLine® Merchandiser. Lightweight aluminum poles with bungee cord snap together to create the base framework, then slide on the pillowcase-like graphic over the frame and zip it closed at the bottom. The zipper is hidden from view and tightens up the stretched fabric graphic for a smooth image. Single or Double-sided Prints. Waveline Merchandiser Exhibits are modular in design. You can create multiple configurations and add-on shelves, garment bars, monitors, lights and more. Build your own custom displays system by mixing and matching our modular displays panels and accessories. These displays can be added to numerous displays or put together for unlimited combinations. 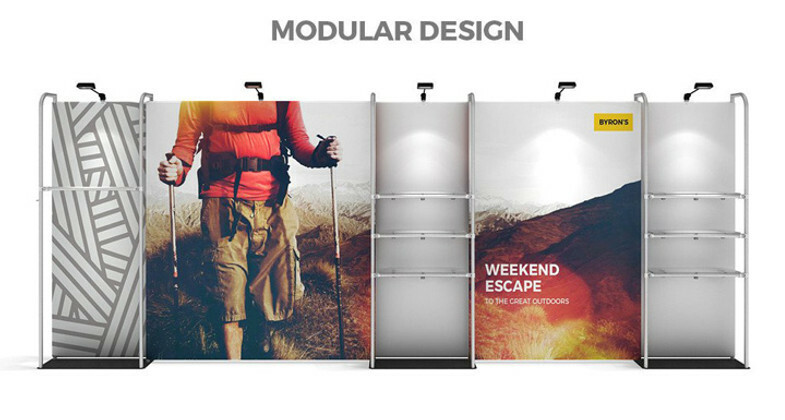 We suggest to use it for Trade Shows, Offices, Showrooms, Backdrop, Photo-ops, Step & Repeat, Partition Wall, Etc.